The flexible, fully-rugged Juno T41 is available in a wide variety of configurations. Build the handheld computer you need: Android or Microsoft Windows operating systems, Barcode Imager, Ultra-High Frequency RFID, Smartphone or GPS collector (or combinations). Every Juno T41 is a reliable small workhorse computer designed to last for years in any environment. The Juno T41 rugged handheld computer is designed to be long-lasting, from the battery to the processor, and to work through mishaps that would sideline lesser products. The Juno T41 handheld is built to MIL-STD- 810G standards and includes an IP68 rating to survive hostile conditions in the field: it can withstand driving rain and liquid immersion, corrosive environments, dust, shock, drops, vibration, prolonged UV exposure and extreme temperatures and altitudes. 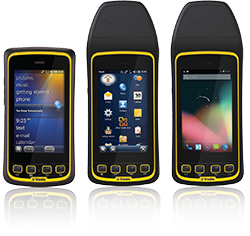 All Juno T41 handhelds come in your choice of either Windows Embedded Handheld (WEHH) v 6.5 or Android 4.1 “Jelly Bean” operating systems. The Juno T41 features an 800 MHz to 1 GHz processor, 512 MB of RAM and up to 32 GB of storage. The 4.3” high resolution Corning® Gorilla® Glass panel capacitive touch-screen is sunlight-readable and beautifully clear. Multi-touch support allows complex selections and controlled zoom to optimize the user experience with maps and detailed information. A capacitive stylus is available as an optional accessory. See the Juno T41 datasheet for complete details.